Russian rabbi; born at Autopoli, government of Grodno, on the 3d of Iyyar, 1837. After having studied under Isaac Hirsch, rabbi of Semyatich, he married, at the age of fourteen, a girl from his native town. 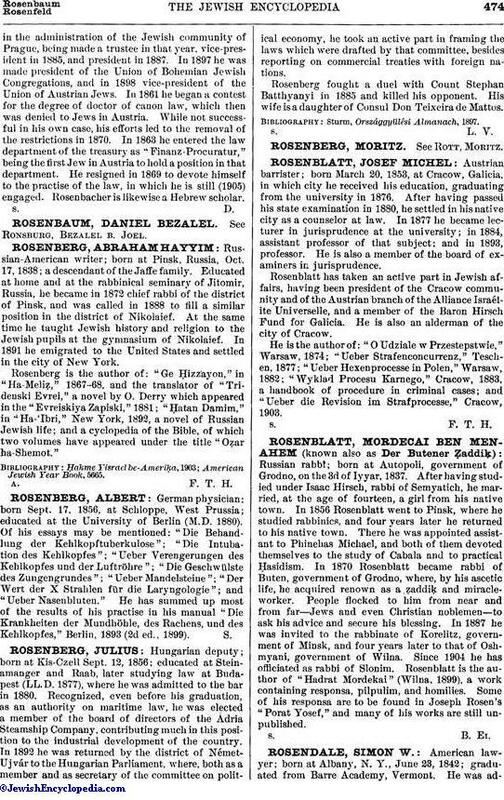 In 1856 Rosenblatt went to Pinsk, where he studied rabbinics, and four years later he returned to his native town. There he was appointed assistant to Plinichas Michael, and both of them devoted themselves to the study of Cabala and to practical Ḥasidism. In 1870 Rosenblatt became rabbi of Buten, government of Grodno, where, by his ascetic life, he acquired renown as a ẓaddiḳ and miracle-worker. People flocked to him from near and from far-Jews and even Christian noblemen-to ask his advice and secure his blessing. In 1887 he was invited to the rabbinate of Korelitz, government of Minsk, and four years later to that of Oshmyani, government of Wilna. Since 1904 he has officiated as rabbi of Slonim. Rosenblatt is the author of "Hadrat Mordekai" (Wilna, 1899), a work containing responsa, pilpulim, and homilies. Some of his responsa are to be found in Joseph Rosen's "Porat Yosef," and many of his works are still unpublished.